Tags: Advertising, Creatives, Design, Digital, Digital Compositing, Editors, Film Studio Backlots, Graphic Design, Graphic Designers, Interior Studio, Location Scouts, Location Sets, Magazines, Photographers, Photography, Photoshop Users, Print, Professional Photographers, Sound Stage. 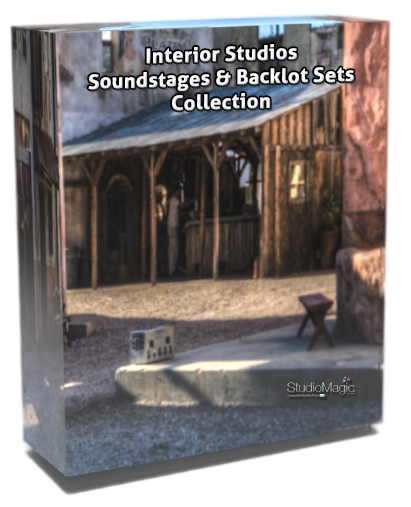 This unique part of the Epic Location Sets Collection contains professionally photographed studio #backlots, #soundstages, and interior #studio images which enable #Creatives of all levels, to place their clients into any scene they desire. A simple drag and drop operation when using #Adobe #Photoshop, and combined with the magic behind LayerCake Elements exclusive StudioMagic Pro Panels, allows anyone to expand their creativity to new heights. If you can visualize it – you can create it.